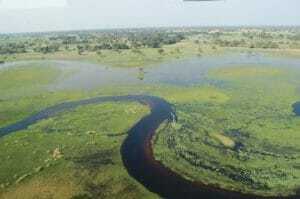 Mokoro rides are a popular activity in the Okavango Delta region of Botswana. 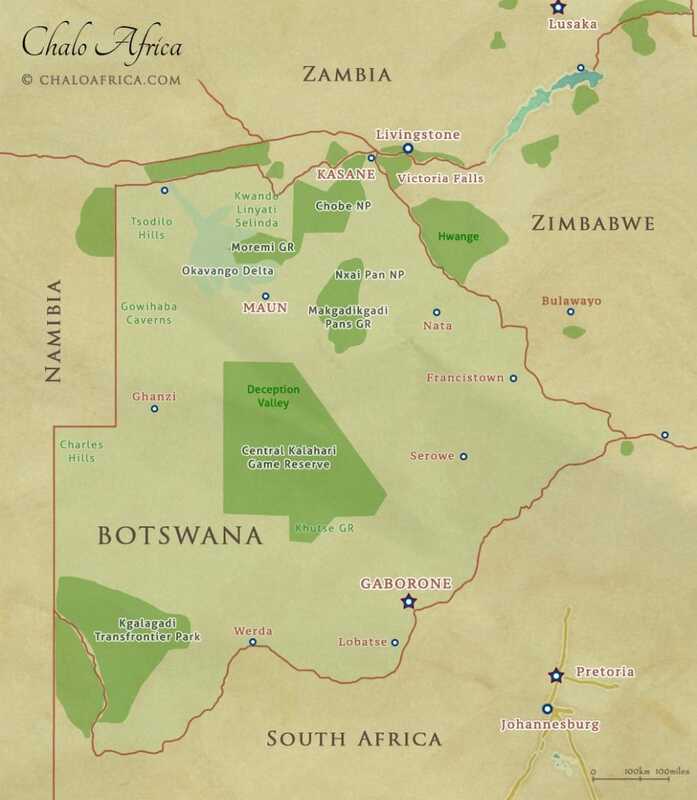 Another important factor to consider in assessing Botswana’s attractions as a safari destination is that whilst sizeable national parks and natural reserves do exist, some of the prime wildlife areas fall outside of these parks and reserves. These are the country’s so-called private “concessions,” awarded to safari operators on a tender basis. Each concessionaire must comply with strict requirements, such as adherence to a sound environmental plan, maximum number of beds and vehicles in the concession, maintenance of roads and game viewing tracks, etc. At the same time, some rules that exist in formally protected areas are relaxed, and various otherwise-forbidden activities (most notably off-roading) are permitted. Off-roading often proves to be a decisive factor in tracking animals – especially in following predators during their hunts. In a nutshell, visitors to private concessions are assured of both privacy and seclusion and a larger degree of freedom in their safari activities. A leopard gazing into the distance. Today, wildlife tourism plays a major role in Botswana’s economy, aided by the fact that its population – in spite of all the economic development of the past few decades – is still very low, thereby permitting vast tracts of the country to remain as game-rich wilderness areas. Moreover, Botswana’s government and safari industry were the first to embrace the philosophy of “low impact, high revenue” tourism, widely seen nowadays as the best way forward for the preservation of Africa’s treasured wildlife areas. Botswana is famed for having the largest elephant population in Africa, a result of vigilant anti-poaching units in Botswana and civil unrest/frequent poaching in neighbouring countries. Elephants in the region, who had previously migrated seasonally across the Chobe River into Angola and Namibia, quickly understood that Chobe National Park in particular was a safe haven for their populations (during the dry season, elephant numbers here reach roughly 50,000). Other areas of northern Botswana, including Linyanti and the Okavango Delta, are also home to significant elephant populations. For the wildlife enthusiast, the elephants of Botswana are an absolute gem, and this experience simply cannot be found in other countries where elephant populations have been decimated. 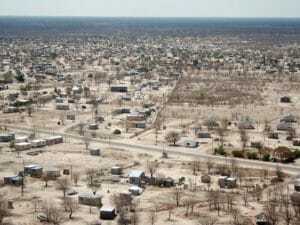 But Botswana is more than just elephants. 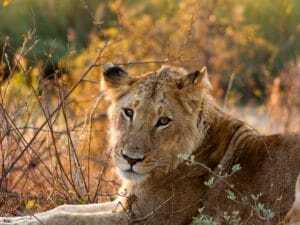 The other members of the Big Five – lions, Cape buffalo, leopards, and rhinos – can also be found at various locations. The country also hosts the second-largest population of cheetah (accounting for about 20% of the world cheetah population), which can be found in some private concessions. The zebra migration across Botswana and Namibia is not only the second-largest zebra migration in Africa, but is also the longest known migration route undertaken by any African animal. The bird species are too numerous to describe here, but rest assured that Botswana is the birdwatcher’s dream. And almost a third of the endangered African wild dog (painted dog) population lives in Botswana, though as there are only an estimated 3,000-5,000 wild dogs left in the wild, the actual population count in Botswana does not number more than a few hundred. Francistown: Originally a key gold mining town, Francistown’s position near the Zimbabwe border and on good roads to Gaborone, Maun, and Kasane has earned it its position as the second largest city in Botswana. Gaborone: Botswana’s capital city is a delightful combination of modern and colonial, and it is conveniently located close to Mokolodi Nature Reserve. Ghanzi: Sometimes called the “Capital of the Kalahari,” Ghanzi is a small town where the traveller can discover and explore the way of the San (bushmen). Kasane: Kasane is the adventurer’s dream – from here, you can do day trips to Chobe National Park and Victoria Falls, as well as visits to Kasane Rapids for birdwatching. Maun: Known alternately as the “Gateway to the Okavango” and the “tourist capital of Botswana,” this city on the Thamalakane River boasts Botswana’s busiest airport and access to Chobe National Park and Moremi Game Reserve. Serowe: Serowe is one of the most historically important cities in Botswana: once the capital of the Bamangwato tribe, the birthplace of the Khama dynasty which is still in place today, and the adopted home of the renowned South African writer Bessie Head. Most travellers do not opt to self-drive in Botswana, preferring instead to work with a travel agent to plan a route and arrange transportation. For more information on how you can plan your Botswana safari, enquire now. 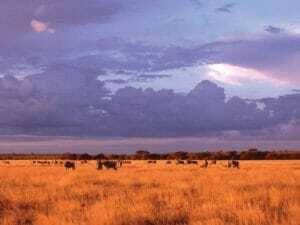 The gateway to safaris in Northern Botswana.